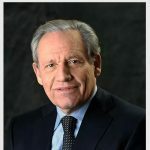 Therein lays the genius of Bob Woodward – a journalistic icon who gained international attention when he and Carl Bernstein broke the deeply disturbing news of the Watergate scandal. The book they wrote - All the President’s Men - won a Pulitzer Prize. Watergate’s theme of secret government is a common thread throughout Woodward’s career that spawned 18 books – all went on to become national bestsellers – 12 of them #1 - more than any other contemporary nonfiction author. In the process Woodward became the ultimate inside man. No one else in political investigative journalism has the clout, respect, and reputation of Woodward. He has a way of getting insiders to open up - both on the record and off the record – in ways that reveal an intimate yet sweeping portrayal of Washington and the budget wrangling, political infighting, how we fight wars, the price of politics, how presidents lead, the homeland security efforts, and so much more. His work is meticulous and draws on internal memos, classified documents, meeting notes and hundreds of hours of interviews with most of the key players, including the president.